Clinton’s words, delivered less than a year ago, stand in stark contrast to her campaign’s newfound focus on racial justice. At the Democratic Presidential Debate in Flint, Michigan last Sunday, both Clinton and Sanders traced the expansion of mass incarceration to the systematic racism enshrined in Bill Clinton’s 1994 crime bill. The credit for the candidates’ recent public awakenings lies with the concerted efforts of Black Lives Matter organizers. This latest collection of Davis’ interviews, essays and lectures takes its title from a popular Southern black liberation song: They say that freedom is a constant struggle… We’ve moaned so long/ We’ve died so long/ We must be free, we must be free. In a speech printed in the book, and originally delivered at Birbeck University in 2013, Davis says she is drawn to the simultaneous sense of “resignation and promise” in the song’s closing refrain. “But are we really free?” she asks. Feminist approaches urge us to develop understandings of social relations, whose connections are often initially only intuited. 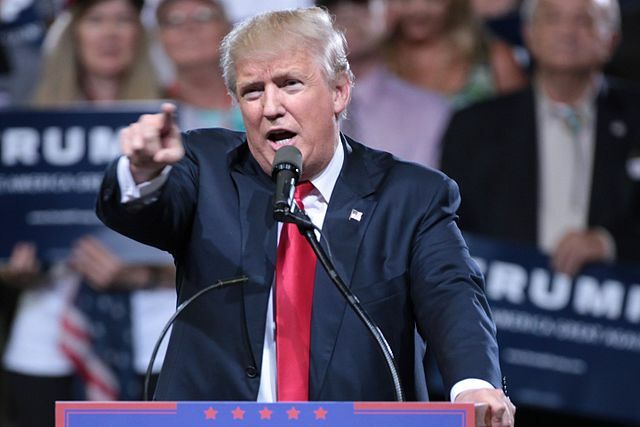 Everyone is familiar with the slogan “The personal is political”—not only that what we experience on a personal level has profound political implications, but that our interior lives, our emotional lives are very much informed by ideology. We ourselves often do the work of the state in and through our interior lives. Davis’ feminist process – a process of connecting seemingly disparate problems and powers – allows her to weave connections between global forces of economic, racial and gendered oppression. 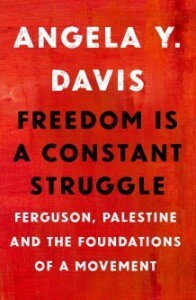 Davis returns often to the example of the interdependent militaries and militarized police forces in the US and in Israel. To show just one way in which the struggles of activists in the states and in occupied Palestine are necessarily related, she tells the story of Palestinian activists noticing that Ferguson police were using the same tear-gas canisters as those used by the Israeli military in Palestine. Showing their transnational solidarity, those activists then tweeted advice to activists on the ground in Ferguson. Unlike many famous men, Davis often opens her speeches by thanking fellow comrades, and by making reference to the conversations and contexts of which she is a part. And as a feminist scholar and monumental historical figure in her own right, Davis remains wary about the “historical closures” that so many commemorative observances—from Mandela’s memorial to the fiftieth anniversary of Dr. Martin Luther King Jr.’s “Letter from a Birmingham Jail”—have the potential to enact. By historical closures, Davis is referring to the tendency to represent freedom struggles as inevitable steps on a road “to an ultimately triumphant democracy.” This often erases the work of those struggles, and the work that remains to be done. Certain moments of Black liberation—King’s dream speech being the most obvious—circulate widely in high school history curriculums and popular celebrations, whereas others—like the Black Panther Party’s “Ten Point Program”—do not. 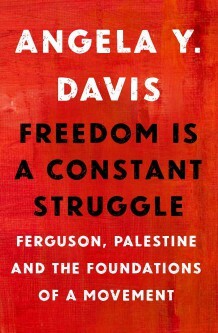 Davis suggests that the Panther’s demands for economic freedom in the ‘70s have not entered the mainstream historical record—or achieved ‘closure’—because they are still “very much on the agenda today.” There are, for instance, more than nine hundred streets named after Dr. King, but “there are also some 2.5 million people in US jails, prisons, youth facilities, military prisons, and jails in Indian county.” Davis does not seek to resolve these paradoxes progress and regression but to hold them up clearly, as a reminder: the victories of the civil rights movement must not render us complacent about ongoing state violence. One way she does so is by fighting against any historical closure her own story may have achieved. While her appearance on the FBI’s Ten Most Wanted List in 1970 today draws applause, Davis cautions against any easy celebrations of her victorious defense against the U.S. government’s absurd terrorism charges. Last year, the FBI placed Assata Shakur, a contemporary of Davis who is in her late sixties, on the Most Wanted Terrorist list. Shakur is not only elderly but has been living a quiet life in Cuba for nearly four decades. In many speeches, Davis points to Shakur’s retroactive criminalization as a sign of how, even while she herself might have been freed, the logic of the 1970s and Hoover’s FBI are still very much with us today. “The FBI is attempting to persuade people who are the grandchildren of Assata’s generation—and mine as well—to turn away from struggles to end police violence, to dismantle the prison-industrial complex, struggles to end violence against women, struggles to end the occupation of Palestine, struggles to defend the rights of immigrants here and abroad,” Davis says. Our generation’s struggles remain similar to those that Davis’ was fighting for nearly fifty years ago.